DaVinci is the cumulation of 23 years of experience in the CRM and contact center integration space. As companies more strongly consider moving away from premise-based communication platforms and onto cloud-based platforms, we wanted to provide a framework to companies to ease this transition. So we created DaVinci, a pure-cloud contact center and CRM integration platform. It’s App-based, so customers can add a variety of pre-existing and custom Apps to their DaVinci profile and be up and running with CRM integration in minutes. 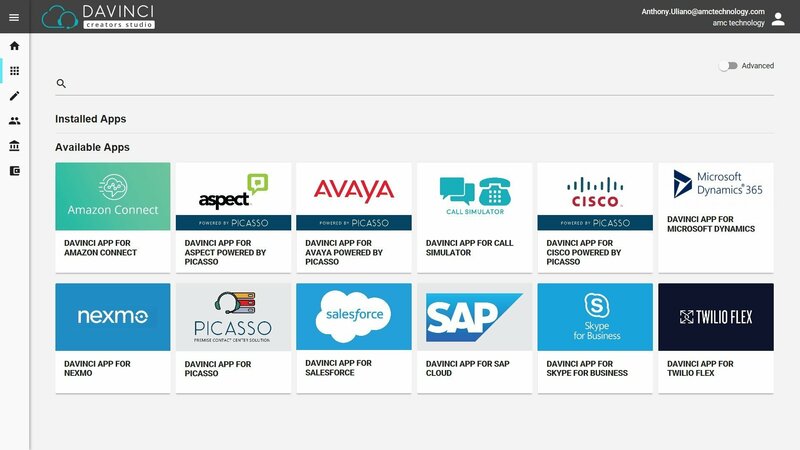 With pre-built CRM Apps for Salesforce, Dynamics, and SAP and pre-built Apps for Skype for Business, Amazon Connect, Vonage / Nexmo, RingCentral, and Twilio Flex, including a pre-built App to Picasso, AMC’s premise Contact Canvas platform, customers can quickly design a unique agent experience. Apps are housed in the DaVinci Framework, which allows each App to share data and events with other Apps. This gives DaVinci the ability to manage presence across channels, collect agent and channel metrics, and share data with CRM applications. Features like screen pop, activity creation, call notes, omni-channel routing, and advanced reporting are all possible across a wide variety of channels. Customers, for example, could configure Skype for Business for agent to agent chatting, Twilio Flex for voice and customer chat, and Vonage / Nexmo for SMS handling. All these channels would be available for the agent and DaVinci would manage them all while providing a seamless agent experience. For those customers that have more simple needs, a single channel App could also be used to handle all these channels through a single multi-channel platform. And we’re going beyond other solutions in the market, by creating even deeper CRM integration. In addition to the standard features typical softphone toolbars offer, AMC has a whole effort around what we call Interaction Augmentation, where we are augmenting what the agent is already doing through additional automated support. For example, we’re offering real-time language translation across the Apps that support text-based channels, so agents can have text-based communication translated in real-time. We’re providing sentiment analysis for each interaction that can be presented to the agent for immediate feedback and stored within the CRM system for enhanced reporting and training. We also perform context analysis, and can present suggestions to the agent, like knowledge base articles or searching for existing cases, without the agent needed to initiate those searches. Whether customers are diving head first into the CPaaS / pure cloud contact center experience or transitioning call centers over time from premise based communication to cloud communication, AMC wants to help you along that journey. 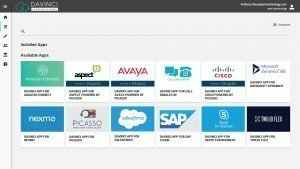 For many years, we’ve provided CRM integration for premise communication solutions from Avaya, Cisco, and Aspect through Picasso, recently renamed, our Contact Canvas for premise platform. When we developed DaVinci, we knew it was critical to provide a bridge from the premise to the cloud, so we developed a Picasso App for DaVinci. Through the Picasso App, customers can still leverage their premise based platform while taking advantage of other cloud based offerings. Customers can use this configuration to migrate users over time from the premise to the cloud, or maintain your existing premise communication platform, while benefitting from new channels being offered by CPaaS providers. All of this configuration is made possible through our Creators Studio, a web-based portal where companies can browse available Apps, add and configure Apps, and add users easily. Our info-card based interface makes it easy to select and configure your Apps so you can be up and running quickly. In a typical deployment, an admin would create an account with Creators Studio, login and select their CRM App, and one of more channel Apps. The admin would then select each App Info Card, which would lead them through the basic configuration required. In the case of some of the CRM Apps, a managed package will need to be loaded in your CRM system, and you’ll be directed to the download and installation process through the App Info Card. Once the managed package is installed in the CRM and the basic App configuration is complete, you’ll be directed to put a simple URL into the managed package configuration and you’ll immediately see the efforts of your work in the embedded DaVinci toolbar. We’re expecting the typical configuration to take not more than 15 minutes and without any server infrastructure deployment. In our first release, we’ve kept Creators Studio simple, so customers can quickly see the value DaVinci can provide, but we have a “expert-mode” as well, that provides advanced configuration options, for things like setting custom reason codes, creating multiple profiles, and even creating your own DaVinci App. If you’re interested in this during our initial launch, let us know and we’ll flip the Expert Mode switch. Although we expect most customers to be able to navigate Creators Studio and create a unique contact center experience on your own, AMC’s support and professional services teams are happy to help. If your requirements are more advanced or you don’t have the technical skills in house, AMC can help you deploy DaVinci and get up and running quickly through our Sprint Deployment approach. I can’t tell you how excited I am for my company to launch DaVinci. We’ve been working behind the scenes for well over a year and it’s great to see our vision come to reality. I look forward to everyone trying out DaVinci and getting feedback from you! Check it out at www.contactcanvas.com/davinci to create your own unique contact center experience today!